Language skills are incredibly important, providing students with a competitive edge in their later career choices, enabling them to compete effectively in a global economy and to contribute as global citizens. In our Faculty we promote the enjoyment of language learning through high quality teaching, fuelling student curiosity and interest and creating a positive attitude towards learning about different cultures and communities. By doing this, we hope to imbue students with an empathy and appreciation of our diverse and multicultural society and foster respect for different cultures, traditions, communities and languages. We aim to offer students the highest possible standards in languages for every year group. By awakening their interest in languages early on, we have a healthy uptake of one or more foreign languages at GCSE and beyond. We also offer an NVQ Level 2 Global Communication qualification in French and German, which has proved popular. All members of the Faculty are graduate linguists who can teach two modern foreign languages. Three staff members also teach Welsh as a second language and Welsh as a first language is supported where required. We offer students the opportunity to study French, German, Latin, Mandarin and Welsh from Year 7. Depending on the level, lessons are taught mainly or totally in the language being studied. Our teaching rooms are well equipped with data projectors and internet access and a variety of media is used widely in our teaching programmes. Each teacher has an area on the school network where students can access worksheets and extra activities, as well as a diverse range of slide show presentations in three languages. Using our home access system, these resources may also be studied remotely at home. Crickhowell High School students visited Nurmeksen Lukio School in Finland in April 2017 as part of the Erasmus KA2 project. 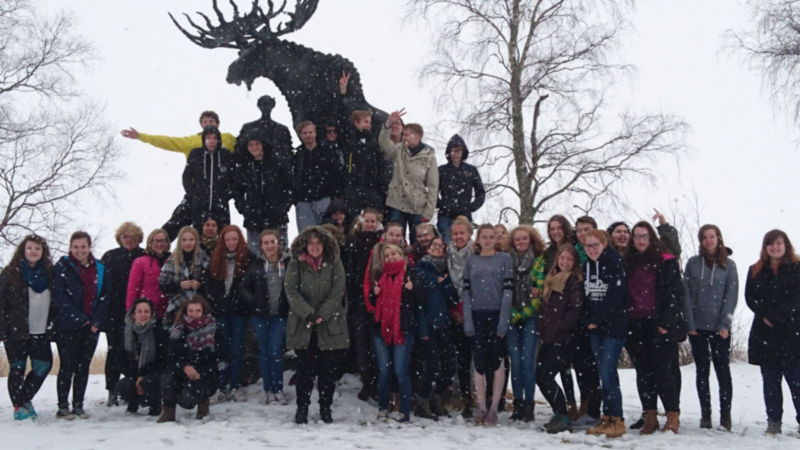 Through our partnerships with schools in other countries, including Finland, Austria, Denmark and the Netherlands, we offer all students the chance to go on residential trips abroad. This enables them to interact with native speakers, build international friendships and become immersed in the culture of another country. Learning languages is just as much about this as it is about developing grammatical skills and vocabulary. We also have a strong extra-curricular programme for language learning during lunch breaks and after school. We have the full British Council International Award, are a Global Learning Wales Lead School and are an ERW Lead School for MFL in Powys. We have close links with the Confucius Institute in Lampeter and were recently granted ‘Confucius Classroom’ status, as a result of our extensive work in promoting the Chinese language and culture. Our official Confucius Classroom opening ceremony will be held in October 2017. We want to foster a love of learning languages that will last a lifetime. We hope that through a “fun” and passionate approach to language teaching, our linguists will leave school confident in their abilities and ready to make a significant contribution to the wider world. 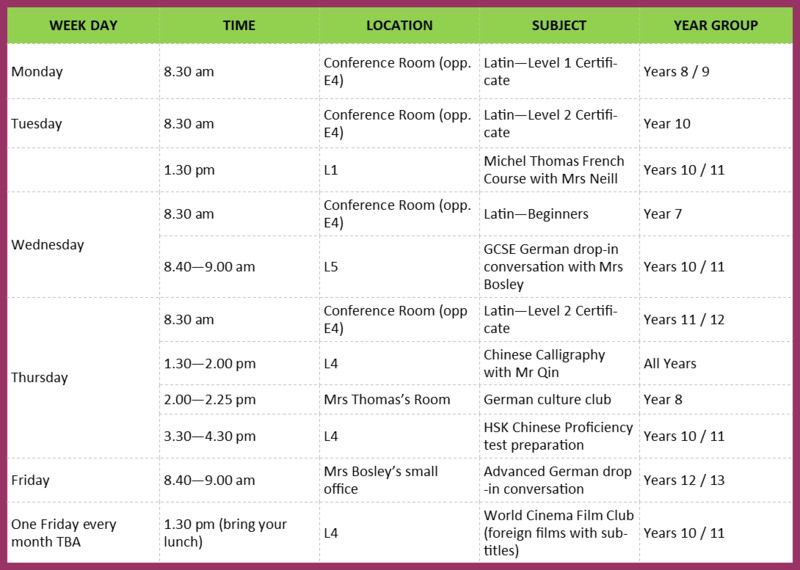 The timetable below details the extra-curricular activities and clubs that are available. Timetables can also be found on the language specific pages and will be available for download once completed. Spy Kids! GCHQ event highlights language opportunities for Welsh school pupils. On 16 November 2017, Government Communications Headquarters (GCHQ) visited the School of Modern Languages at Cardiff University to host an event entitled “The Word Is Not Enough” to give Year 10 pupils and budding linguists from across Wales an unprecedented insight into their work. A team from Crickhowell High School took part in this top-secret event to learn more about how language skills are crucial in the UK’s intelligence services. To illustrate how multilingual staff are essential to GCHQ’s remit, pupils from a number of Welsh schools became language analysts for the day, taking an area of government work as a theme. For the full story, visit Cardiff University’s website at http://www.cardiff.ac.uk/news/view/1035409-spy-kids!-gchq-event-highlights-language-opportunities-for-welsh-school-pupils.